It's hard to know where to begin with Poe. On the face of it, he was a small man who lived a financially cramped life and who came to a mysterious, painful death. Over 150 yers after his death, his stories still raise not only the hairs on the back of your neck, but questions like - is this supposed to be frightening or funny? 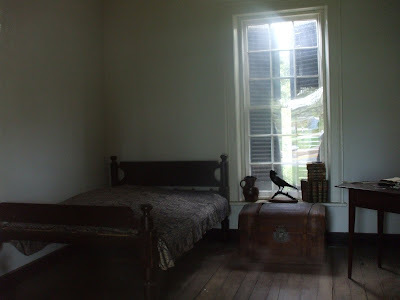 More than that, it remains unclear even where Poe belongs, in biographical terms he is hard to pin down. 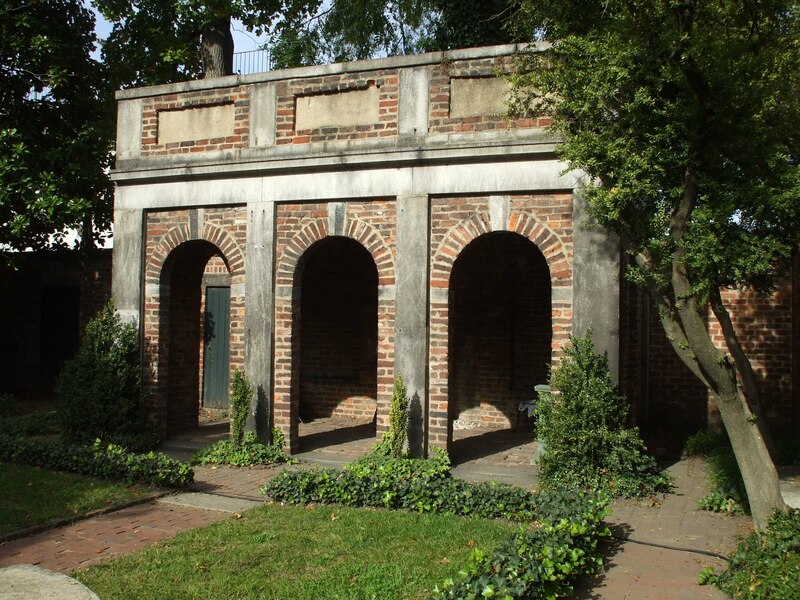 He was born in Boston, lived in New York, London, and Baltimore, but he styled himself a 'Southern gentleman' rather than a New Englander or even a 19th century cosmopolitan, like Nathaniel Hawthorne. Maybe it is that ambiguity, and nebulousness that makes his so open to appropriation by artists as diverse as Sylvester Stallone,whose movie of Poe's life comes out in 2012; Maya Angelou, who as a girl thought of him as her 'own personal EAP', and Baudelaire, who translated him into French. 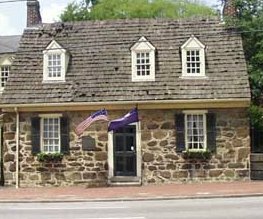 The city of Richmond gets in on the act with its Poe House. It's on a dusty, neglected street in the industrial part of town, nothing like the clustered houses clinging to shuttered, faded glory along the lines of the rue Morgue. It's not a sinister mansion, either, although St John's, on the hill above it, is a bit creepy. Perhaps Poe got some inspiration from the chateau-like railway station about 5 minutes walk from the house - it certainly seems a likely place to hear strange banging and ticking - all those attic windows could host an army of mad women. The Richmond museum was never Poe's residence; he stayed here with his mother's relatives from time to time, he slept, we're told, in this tiny bed. 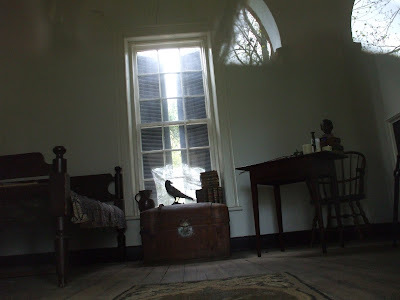 Indeed, several of the display rooms weren't part of the original house at all, but have been co-opted into the structure in the name of historical interpretation. We forget to ask if they are at least of the dsame vintage as the 'original' bit. 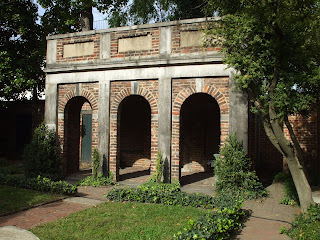 The Museum is set around a neat, melancholy courtyard, closed off but a sad little portico of a temple. 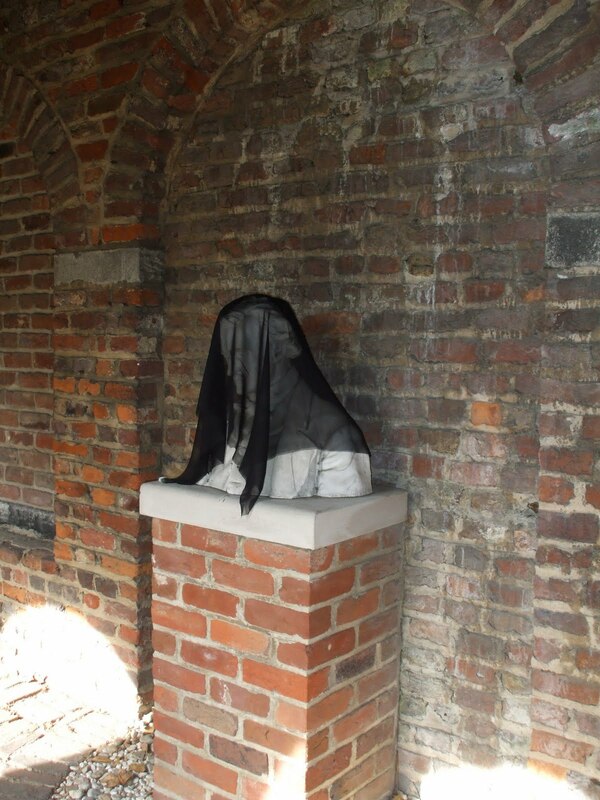 Inside, in melodramatically draped in black, a bust of the author. 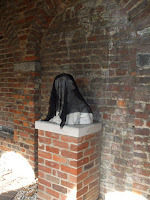 We visited on a Sunday, and the courtyard was decked out in black, for a wedding; a rather grim seeming affair, the bride was putting the final touches to her outfit up in the room where Poe's last days on earth are speculated over in ghoulish detail. She looked a little pale, but that might have been the TB, it's the kind of place that makes you want to go for a check-up, or at least grab some hand sanitizer. 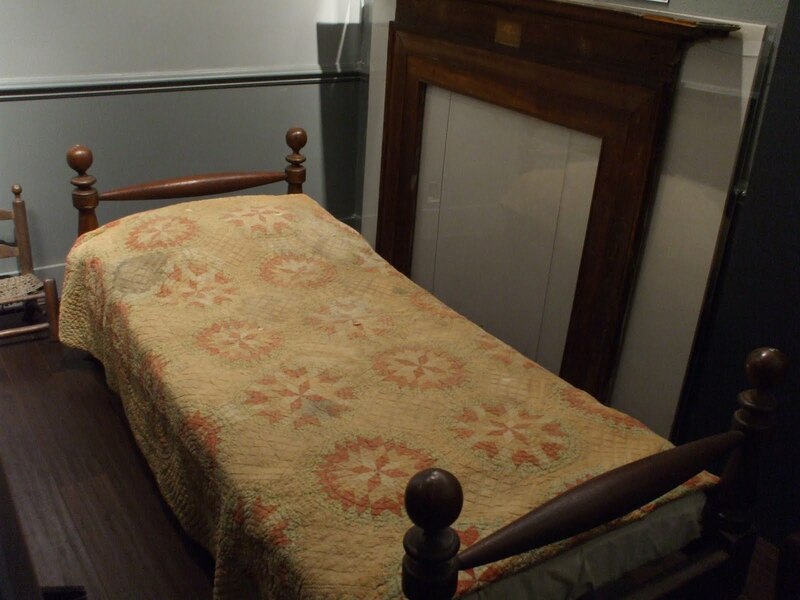 In Charlottesville, you can see the room Poe used when he was a student. It's simply one in a row of rooms, the rest still occupied by undergrads. 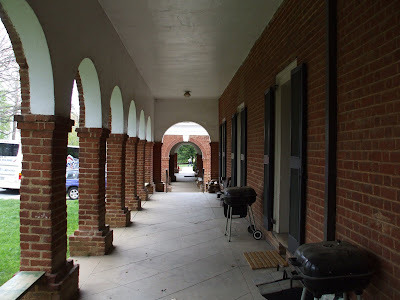 The presence of so many barbecues under the portico makes you wonder if they are roughing it or just very into burnt meat. it may simply be indicative of the quality of food services on grounds, and the prices at the Corner.